This guide shows how to configure a Mikrotik router in order to make its Hostpot service to use Amplespot as external login (splash page) provider. This guide assumes that you have experience working with Mikrotik and does not replace the original Mikrotik documentation. If you would like to use the secure version of Amplespot Captive Portal (over https) - make sure you have a correct SSL certificate installed on your router. It is also necessary to get the Winbox client (it is recommended to get the last version of the tool at http://www.mikrotik.com/download). pot Captive Portal (over https) - make sure you have a correct SSL certificate installed on your router. Launch the WinBox app. Wait a while to get MAC Addresses list. Make note of that MAC address, we will need it for the Hotspot setup in Section 3. Select requested address (not IP if you are in a different network). Repeat this step to create a secondary RADIUS server. Go to IP in the left-hand menu and then open Hotspot. Click Hotspot Setup button to create new hotspot server. Select the Interface where you want the hotspot to run. This can be a wireless, bridge or ethernet interface depending on your network architecture. Complete rest of the steps to create the hotspot server. The settings will depend on your network architecture. 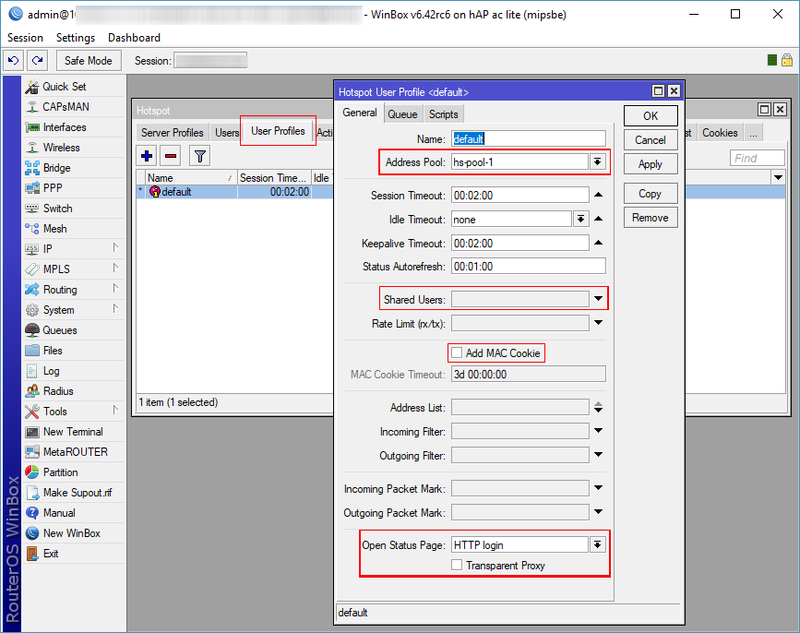 Refer to Mikrotik hotspot documentation for additional info. Change this to the dash-delimited MAC address of the Ethernet interface your router (as noted in section 1), followed by a semicolon, followed by the name of the guest SSID that you will use with this hotspot service. Select the User Profiles tab and edit the default user profile. The Walled Garden needs to be created in order that the wifi users can access online resources required in order to load Splash Pages hosted by Amplespot as well as other external resources required for social media network authentication. Review this Mikrotik documentation article for more information. We will configure Walled Garden via the script. You may need to add more domains depending on sign-up options you would like to use in Amplespot Captive Portal - find up to date list of Walled Gardens here. Click Apply and Run the script. You can now find Walled Garden created in Hotspot settings. Walled Garden entries can also be added manually via Hotspot menu. We will now edit the hotspot login page so it will forward end-users to Amplespot service (splash pages). you can use https instead of http if you have a valid certificate in your hotspot. Select the Access Point's make and model, type in MAC Address (from step 3 of this manual) and Name, Select the Country and the Captive Portal Zone where you would like to add this Access Point. You will be able to move your access point to other Zones later. Make sure that the name of the SSID used by the Captive Portal Zone you are selecting exactly corresponds to the name of the SSID on the Mikrotik router. Click Add Access Point. You are done!